Google Search Wiki - first impressions - the future of Search? I have previously written about Google's experiments in Social Search and these have now moved from test phase to launch - with the announcement of the Google Search Wiki. Through iGoogle, Google users now have the chance to promote / demote results on their personal searches, see a historic record of all the edits / comments they have made on each search and also see the edits / comments other users have made. 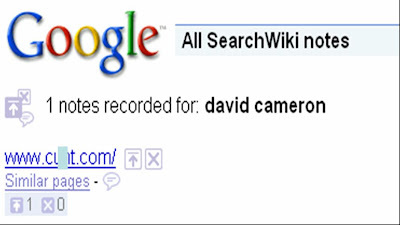 With personal searches, particularly around love / hate characters like politicians, the potential for abuse is high – as demonstrated by the results for ‘Sarah Palin’ and ‘David Cameron.’ There also doesn’t seem like a way of removing these / flagging them as inappropriate on every result. On most comments you get ‘thumbs up’, ‘thumbs down’ and ‘flag for inappropriate content’ options (see my Sarah Palin example), but on the David Cameron comment there seems no way of flagging the content that has been appended to it. 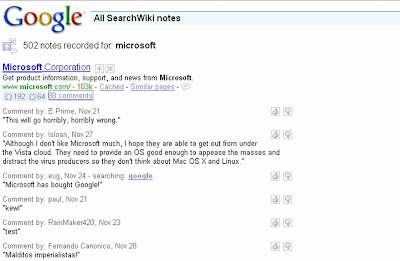 Moderation and quality will be a key thing for Search Wiki. There seems to be a missing piece here – the lack of community. On the one hand everyone can see the edits / comments left, but changes to results are only affected at an individual level. If there were ways of changing results for a community of interest / network of friends then I think this could be a lot more powerful. Much in the way that Wikipedia can be edited by anyone for the benefit of everyone else or information that you publish through a social network is shared with your contacts, ‘improving’ search results for a network of contacts could create something ultimately more useful - effective collaboration trumps individualism. This is the model being pursued by Wikia and other social search engines, however if this social search model can be applied at Google’s scale then it could radically change the face of Search forever. The Google Search Wiki could therefore be the start of something really significant, but to do so it needs to be 'socialised'. 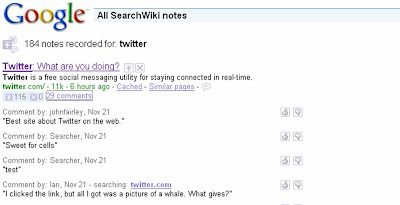 MSE360, 123People.com, Social Mention and new Google Blog Search - latest social search developments! 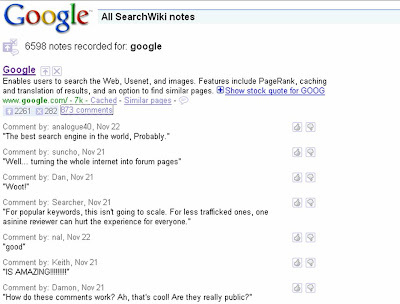 Gooogle search wiki is soo crazzy! The comments shouldn't be made public and that'll take care of everything!